The DreamLine Aqua Lux is a frameless tub screen with European appeal and modern architectural design. With a stunning curved silhouette that creates an open, inviting feel, the Aqua Lux will transform your bathroom with elegant style to match its functionality. Also available with Optional Extender Panel (SHDR-3348588-EX) or Return Panel (SHDR-3348588-RT) configurations. The DreamLine Elegance-LS pivot shower door or enclosure has a modern frameless design to enhance any decor with an open, inviting look. The Elegance-LS easily becomes the focal point of your bathroom with a custom glass look at an unmatched value. DreamLine exclusive ClearMax water repellant and stain resistant glass coating adds superior protection from stains and is nearly maintenance-free. IMPORTANT. Measure the width of your shower space AFTER walls are finished (tile, back walls, etc.). Optional SlimLine matching shower base available for some model sizes (sold separately). 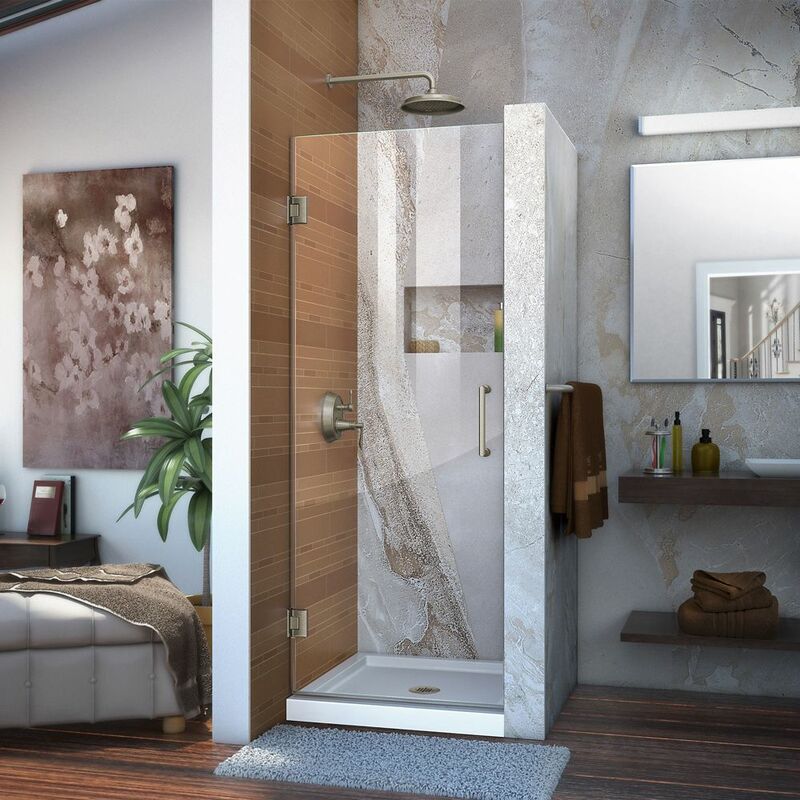 The DreamLine Lumen semi-framed swing shower door offers unique style and functional appeal, while keeping your budget in mind. The Lumen has a modern wall profile design with integrated hinges (patent pending). Complete your shower space renovation quickly with the simple set up and easy installation of the Lumen shower door. Choose DreamLine for the ultimate solution for your shower project. Limited Lifetime Manufacturer Warranty (Oil Rubbed Bronze or Satin Black hardware finish limited to 1 (one) year warranty). Unidoor 25-inch x 72-inch Frameless Hinged Pivot Shower Door in Brushed Nickel with Handle is rated 5.0 out of 5 by 47. Rated 5 out of 5 by Matt from The door looks great installed. Definitely a two person... The door looks great installed. Definitely a two person job - it is heavy. Rated 4 out of 5 by AJTSTOCKS from Very nice door. Was easy to install. The only issue... Very nice door. Was easy to install. The only issue I have with this door is the handle. The outside has a nice loop. The inside only has a knob. This makes it more difficult for someone with arthritis. I contacted Dreamline to see if they have a second loop for the inside. That is not an option. Rated 5 out of 5 by Tom from Home Depot ordering and delivery (one day early) worked smoothly.... Home Depot ordering and delivery (one day early) worked smoothly. Product is beautiful but absolutely needs better hinge screws (Home Depot does not carry stainless screws in comparable size-ended up using hardened furniture screws (much harder to strip). Installation instructions easy to follow. Rated 5 out of 5 by Springhouse from This door is extremely nice! The only thing difficult about using this door is that you have to ... This door is extremely nice! The only thing difficult about using this door is that you have to have both sides of the finished opening perfectly plumb and between 25 inches and 25 and 1/8 inches between the sides of the opening. The actual glass is 24-7/16" and when the hinges are attached the width of the glass and the hinges is 24-7/8". The L strip that will be installed on the side away from the hinges takes up almost 1/8". This information is not in the specs or instructions but it may be helpful to some people.